When You Reach Me by Rebecca Stead. Wendy Lamb Books, an imprint of Random House. 2009. Copy from ALAN. Middle Grade. The Plot: New York City, 1979. Miranda, 12, is finding out that life isn't what you expect it to be. One moment, you have a best friend; the next, for no good reason, he doesn't talk to you. Mira starts to make friends with others, but the loss of her best friend, Sal, for no good reason haunts her. Soon there is another mystery to solve -- mysterious, cryptic notes that appear in odd places, urging her to do something -- to write a letter. Which will somehow save a life. 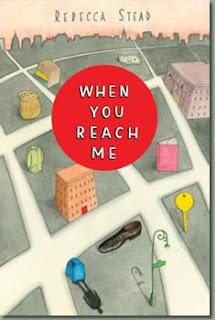 The Good: When You Reach Me has received a ton of attention; from a New York Times review to being on the Kirkus Best Books for Children 2009, with a side helping of Newbery buzz over at the School Library Journal Blog Heavy Medal. That is a lot of hype to live up to, and it's sometimes unfair to the book that you go in expecting greatness instead of just hoping for a "good read." So when the book DOES deliver everything people said, and more? You know it's a damn good book. (Heh. That's one quote that has no hope of every being used by the publisher: When You Reach Me. Tea Cozy says, "it's a damn good book.") This gets added to my list of "favorite books read in 2009". In part because this has been discussed everywhere, this is more an essay than a recommendation so spoilers are everywhere. Read at your own risk. Miranda and her mother have a wonderful parent-child relationship; it isn't perfect, but it is healthy and happy. Miranda's mother became pregnant back in law school, dropped out, and now is a single mother, working as a paralegal. They live in a run down apartment, and Miranda's mother is hoping to hit the jackpot -- she just got accepted to be on the gameshow The $20,000 Pyramid. Miranda, her mother, and her mother's boyfriend, Richard, spend hours practicing. The mother is an incredibly strong woman, shifting her dreams of law school to simply being able to support her daughter and -- very important to my reading -- not using Richard, the well off lawyer, as her Prince Charming to save and rescue her. She dates him but doesn't see him (or use him) as her future or her hope. And Richard feels the same way: he offers emotional support but not financial. He is a strong, positive influence in Miranda's life but he isn't there to rescue either Miranda or her mother. On the surface, this is typical school story centered on the dynamics of friendship: old friends lost, new friends made. But it's more about Miranda being able to see things outside her original narrow viewpoint. The cause/effect she saw behind what caused Sal to stop being her friend? Wrong. The "rich girl" in class being mean to her? Wrong. When You Reach Me is about that journey to seeing the bigger picture behind what an individual sees and believes; a journey that some adults never seem to have made. While Stead has Miranda reading A Wrinkle in Time , the L'Engle book I was reminded of is Camilla , not only because of the New York City setting but also because at one point Camilla talks about when she realized there was a world outside her own head: "What did other people think? What did other children think when they weren't with me?" It is this process Miranda is moving through. The intricacies of friendship, of making friends, being friends, other people's motivations, all come back to the realization that it's not all about you, or as you originally see it. Miranda not only doesn't realize the real reason Sal stopped walking to school with her; she also doesn't see the truth of the friendships around her, viewing them as mean girls. She finds out -- and comes to terms with -- the knowledge that others may see her, Miranda, as being the "mean girl." How we see things, how Miranda sees things, makes When You Reach Me not just a mystery of notes left, but also a mystery to solve in how we navigate the world, how we see others, and how we link events to create cause/effect that are not necessarily accurate just as how there may be unintended consequences to thinks we do or don't do. Neither the reader, nor Miranda, fully understands or sees what the story really is until the end of the book. This is true both for the mystery of the notes and the mystery of friendship. Which brings me to 1979. I'm about a year older than Miranda was then; and I enjoyed the references to the late 1970s and also liked how Stead didn't overwhelm with pop culture references. But why, I ask myself -- as I always do with books set during the author's childhood -- why 1979 and not now? I think Miranda's mother is part of the reason; a pregnant law student today would have different resources and different options available to her. The New York of the 1970s is different from the New York of today. In Miranda's Manhattan (like the Manhattan of my mother's childhood, twenty years before), kids had the freedom of the city provided they were a little street smart; and everyone, parents, teachers, adults, children, were fine with that. Miranda has rules about how to react to someone hassling her on the street; my mother, growing up in the same general area of Miranda's neighborhood, was told to ignore those men exposing themselves in the playground at Central Park. Yet, there was also an innocence still, in the pre-Gossip Girl days. The economics of it all also seem distinctly 1970s. In school, there are kids like Miranda, children of working parents (Miranda's mom is a paralegal; Sal's mother is a nurse) and children of wealthier parents (Julia has traveled to Europe, Annemarie lives in a fancy doorman building). While I'm no expert on NYC today, my guess is that a single mother with an infant, just getting a job as a paralegal, with no additional family support, would not be able to afford a two bedroom apartment, no matter how crummy, dirty, and run down that apartment is. Sal and Miranda would be priced out of NYC; and unless the local school was a charter one, I'm guessing Julia and Annemarie would be at private school. While this is not a time travel book, it is a book that includes time travel. That brings another reason to set it in 1979, and perhaps the most important of all -- because the reader, just like time traveler in the book, goes back in time to 1979. This shift, of the present being the past for the reader, adds to all the time travel elements discussed in the book. We may not be as scrambled as the time traveler; but we are slightly off in where we are because it is 1979, not the present. The past has already happened, and we know it has already happened because right now, this moment, it is not 1979. Time is set; so no, the time traveler cannot decide to do anything different than what was done. Setting this in the past allows the reader to be both in the present and the past as they read the book. The time travel is not fully explained; a choice that some have seen as a negative. Personally, for me, it was enough to say that sometime in the future, a form of time travel was worked out that allows a person to travel back in time, unable to bring anything, and with a scrambled up mind as a result, was enough. The "naked time travel" trope is one I encountered first in 1984,* with the first Terminator , and, as I said above, Stead sticks to the facts of time being unchangeable. If something happened in 1979, it always happened in 1979. *Note I said when I first encountered; I am not expert enough in the history of time travel in books and movies to say when naked time travel first was proposed. Indeed, you said it well, it is a damn good book. As I shared when I posted about this book, I kept thinking as I read it how much my sixth grade class in 1970 would have related to this book...the discussions would have been rich and long! Thank you for this posting.